Mitsubishi Imaging TPU-100 Premium OHP Transparency Film for Inkjet (8.5 x 11", Letter, 20 Sheets) - Putting together an important presentation? 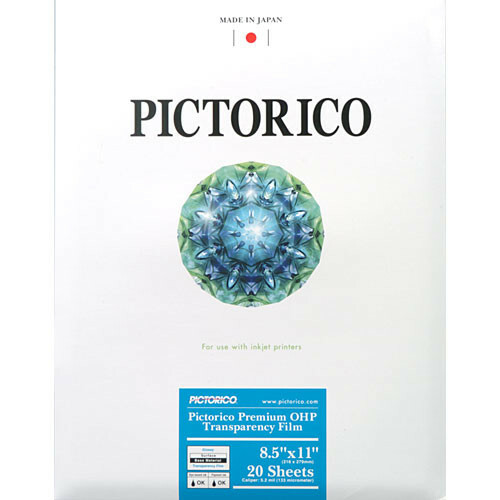 Pictorico's OHP Transparency Film delivers crisp, easy-to-read text, brilliant, non-smear colors, and water-resistant images that enhance your visual display. Note: Newer versions of OHP Transparency Film (TPU100) may appear to have a slight milky appearance. This does not affect print quality. Box Dimensions (LxWxH) 12.2 x 9.45 x 0.2"
TPU-100 Premium OHP Transparency Film for Inkjet (8.5 x 11", Letter, 20 Sheets) is rated 4.8 out of 5 by 57. Rated 4 out of 5 by Cocky Mephisto from Great for Alternative Processes This material is great for use in making digital negatives with your photo ink jet printer. (thinking specifically of the Dan Burkholder method) Only problem I have with it now is that the manufacturer has placed a milky opaque coating on the print side to assist in keeping the ink on the transparency. The consequence is that your digital negative will never be totally clear so plan ahead and either make your negative larger than your image (to avoid unintentional bordering), or build in a digital border around your image. Also, handle your digital negatives with care. The image will scratch easily. Otherwise, it's a nice inexpensive way to create digital negatives for use in Alternative Process Photography. Rated 4 out of 5 by Anonymous from An unexpected use. I'm a hand engraver and use this product to transfer images to metal. Images are printed backwards with an inkjet printer. The surface of the metal is coated with Dammar varnish. Once the varnish dries the image is placed face down on the metal and burnished. It works great. I just hope, with overhead projectors being almost extinct, they keep making this product. Rated 4 out of 5 by Anonymous from Digital Negatives I have used this product to create digital negatives for my non-silver contact prints. The fact that they are digital negatives gives me the ability to easily reprint and alter the negative. I have found that the negatives tend to get minor scratches and easily get water spots (should they touch water), but this has not been noticeable on the prints themselves. If I were intending to have pristine negatives, I would recommend placing a protective sheet of acetate between the negative and the emulsion on the paper. Overall this is a good product. Rated 5 out of 5 by verycherry from Premium OHP Transparency Film for Inkjet I have used this and several other types of film transparencies for making digital negatives, which I then use to make contact prints, namely cyanotypes and vandyke brown prints. Pictorico is the best around! The ink doesn't smear so there isn't any problem with it getting sticky or sticking to the paper. I really can't think of any down side to mention. I'm perfectly happy with it and won't be switching. Rated 5 out of 5 by Anonymous from This paper rocks! Creating digital negatives for alternative process photography with this paper is super easy. The tonal range of the paper is far greater than that of standard transparency paper and it really works well even in a cheesy $ inkjet printer. I'll definitely purchase it again. Thanks for carrying this B&H. Rated 4 out of 5 by Anonymous from OHP Not for Artisan 810 Pictorico OHP Transparency Film is the standard for making desktop negatives for contact printing. Unfortunately, the Epson Artisan 810 does not support transparency printing. Even if you 'trick' the paper detector by taping the film to a piece of paper, the ink does not stick to the film. Rated 5 out of 5 by Anonymous from Pictorio Digital Negatives Love love love the Pictorio for my digital negatives. I love how sharp and clear my final images come out! I use pictorio for all my digital negatives and pictorio hasn't failed me once! what is the difference between this and pictorico pro ultra premium ohp? Ultra version differs from standard Pro Premium transparency sheets in its excellent compatibility with Epson UltraChrome Photo Black K3 ink. Will it work with a HP laser printer?